Originally developed in the 1860's from the Shanghai breed (or Cochin as it later became known) and mated with several different breeds including Dorking and Wheaten Old English Game, they were never standardised by an official body but associated with the county of Lincolnshire. Lincolnshire Buffs were an important part of Lincolnshire agriculture before 1900 but the breed disappeared, as did many other poultry breeds. The Lincolnshire Buff was fast growing, easily raised, was a good winter layer and with its white-pigmented skin made an excellent table bird. By 1920 the breed had just about disappeared from farms, often being replaced by the Buff Orpington. 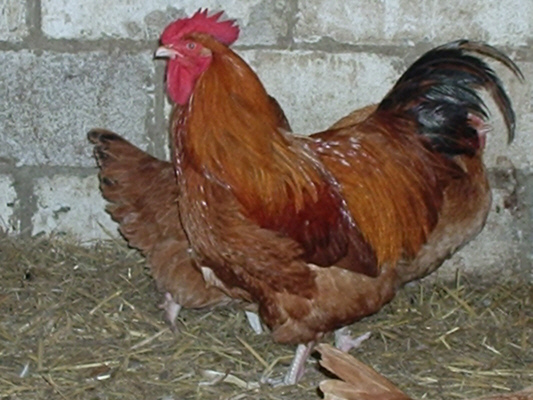 When William Cook introduced the Buff Orpington in 1894, he claimed to have developed it without Lincolnshire Buff blood. Many doubted his statement but due to the rise in popularity of the Orpington, the result was the decline of the Lincolnshire Buff. Since 1987, Lincolnshire Agricultural College has been conducting breeding trials of the Lincolnshire Buff and in the late 1990's a club was formed and the members pressed for the standardisation of the breed. The standard for Lincolnshire Buff has been drafted to emphasise the distinct difference from the Orpington. The Lincolnshire differs from the Orpington in being a longer-backed bird which carries its tail lower and has much tighter feathering. An obvious difference is in the legs which should carry an extra claw making it 5 toed. This extra toe must be well separated from the conventional rear toe and be pointing upwards.